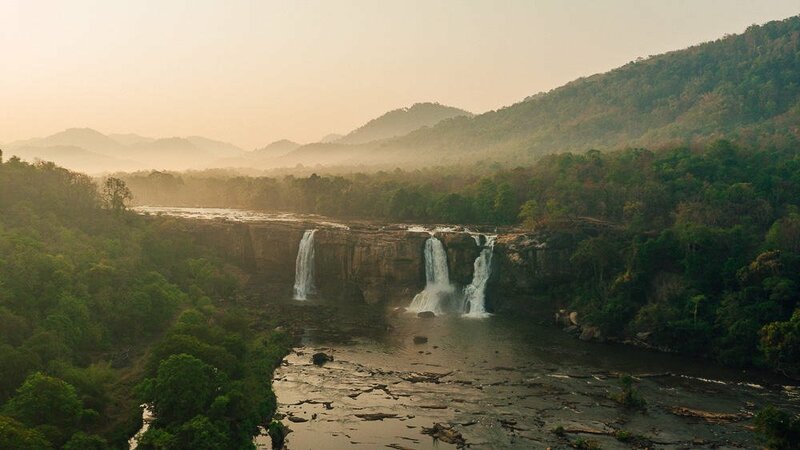 Athirapilly is most commonly known as the land of rivers and forests, and it plays home to Kerala’s largest waterfall, Athirappilly Falls, which is an impressive 80 foot tall! 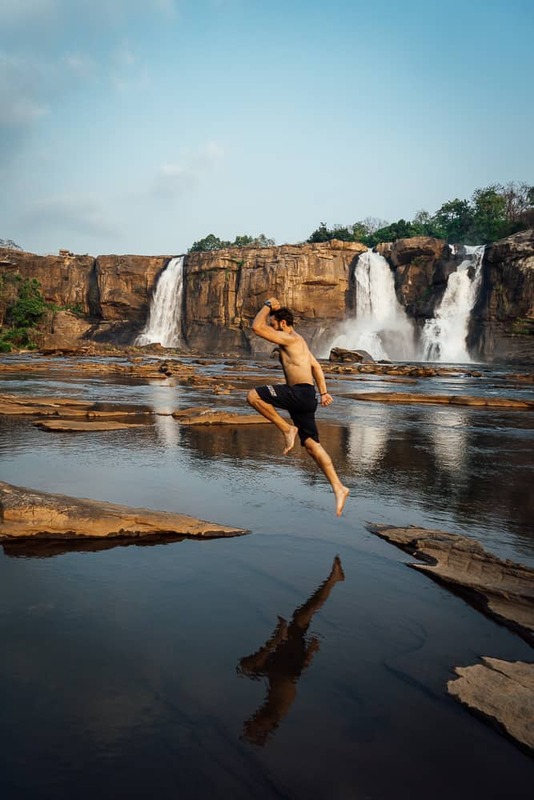 I spent one full day exploring Athirappilly Water Falls and have put together this complete guide of all you need to know before you go. Athirappilly Falls is located in Athirappilly Panchayat, Kerala. Athirappilly Falls is 72kms North-East of Kochi and the journey time takes approximately two hours, depending on traffic. #1 Local Bus: Local buses operate daily from Kochi City to Chalakkudy and the cost is around 20-30 rupees. There are countless bus stations located around Kochi so it’s best to ask your accommodation where the nearest one is to you. These buses are not air-conditioned. There are also daily buses leaving from Kochin Airport to Chalakkudy which are air-conditioned and the cost is between 80-100 rupees. 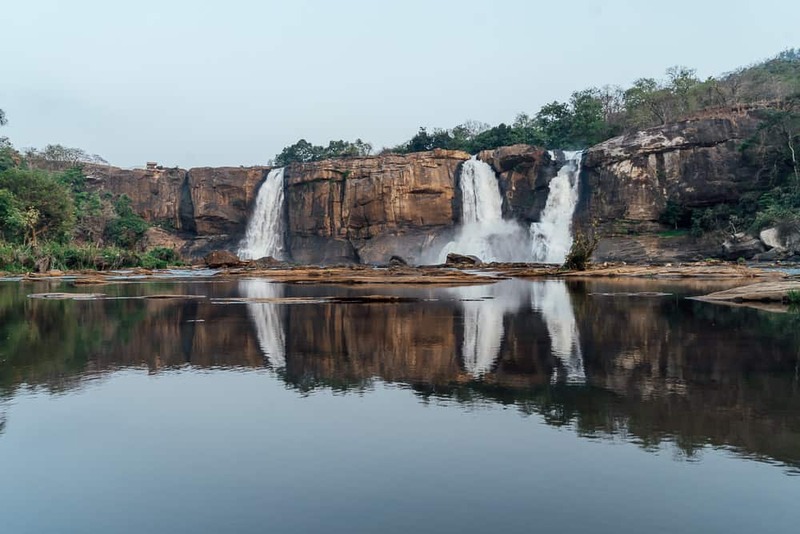 Once you reach Chalakkudy, Athirappilly Falls is a further 45-minute drive. There is another bus that runs to Athirappilly from Chalakkudy that costs 20-30 rupees or alternatively you can take a tuk-tuk which will cost around 300-400 rupees. 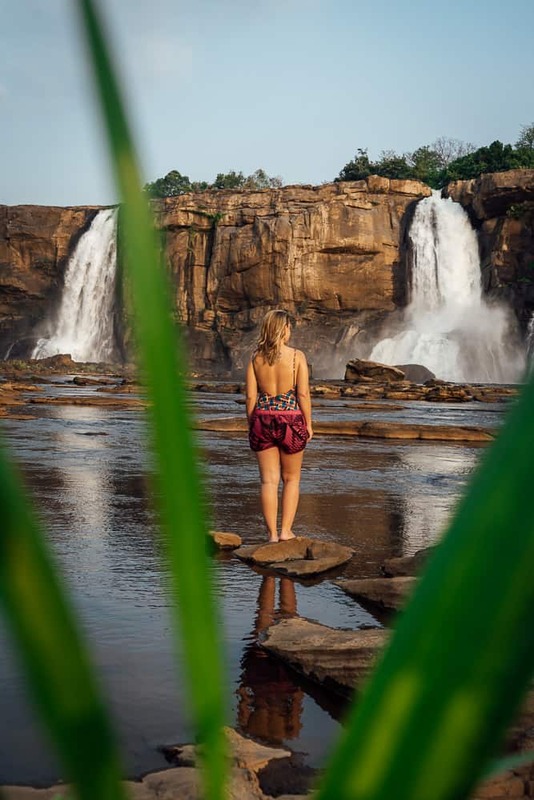 #2 Taxi: If time is sensitive and budget is not an issue then I recommend you take a private taxi from Kochi directly to Athirappilly Falls which costs around 2000 rupees. 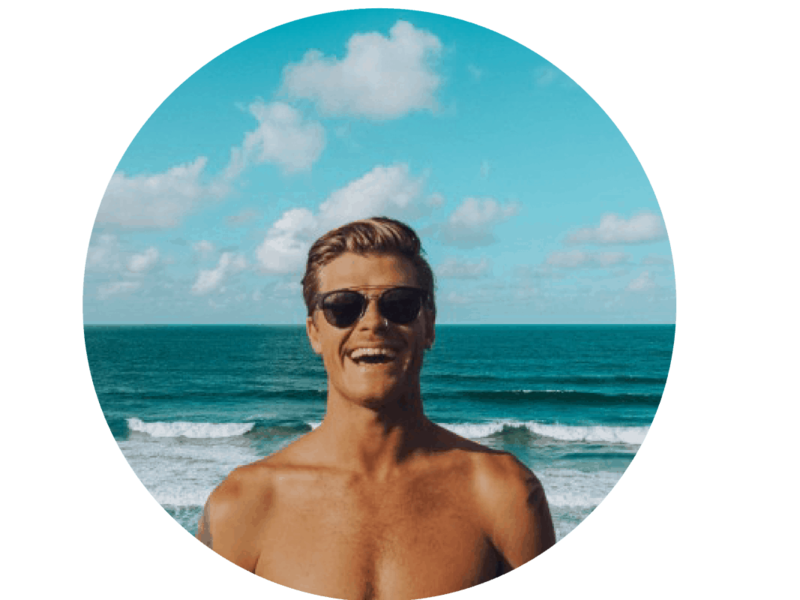 The taxis are air-conditioned and if you are travelling as a couple or a small group, sharing the cost of the taxi is the way to go. Athirappilly Falls is often referred to as the Niagara Falls of India. This insanely beautiful waterfall is fed from the Chalakkudy River which originates from the upper reaches of the Western Ghats. 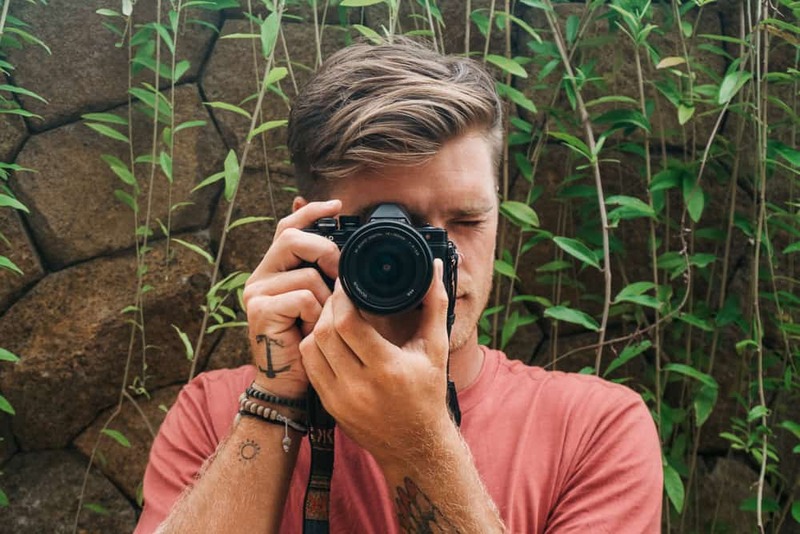 My friends and I arrived in Athirappilly at around 10am and checked-in to the Rainforest Resort, where we stayed for one night. 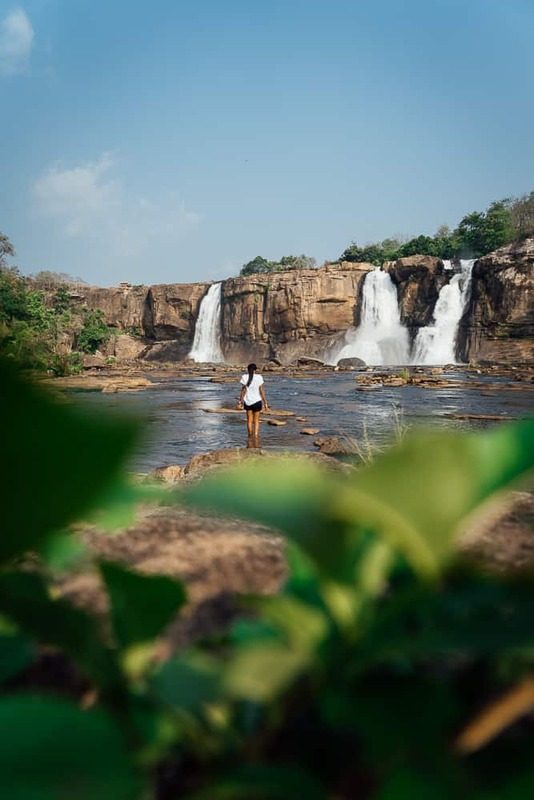 There are many resorts and hotels in this region but this particular resort in Athirappilly offers the best views of Athirappilly Falls and it also has a private walking trail directly down to the base of the falls. What more could you want? Click Here to check availability and rates at the Rainforest Resort. The trail down to Athirappilly Falls is a combination of steps and off-road terrain. The casual hike only takes five to ten minutes before you reach the Chalakkudy River and here you can cross the shallow stream which emerges at a wide-open clearing, just fifty meters away from the base of Athirappilly Waterfalls Kerala. 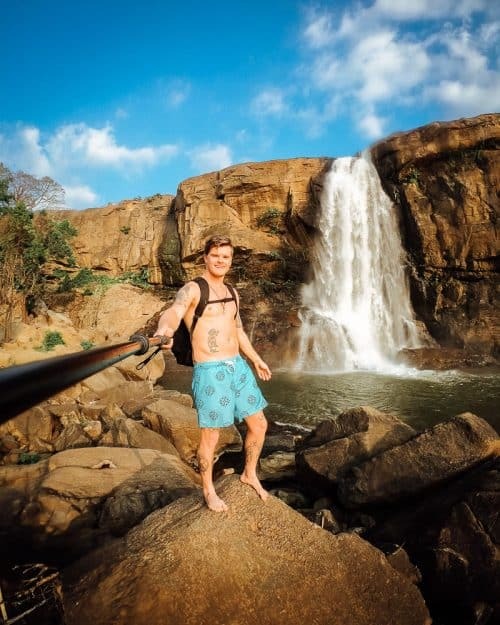 We spent the entire afternoon exploring and swimming around the shallow waters at Athirappilly Falls as there are many different rock pools to discover. After we spent some time here we wandered up the river’s edge to get to a closer vantage point at the base of the falls. 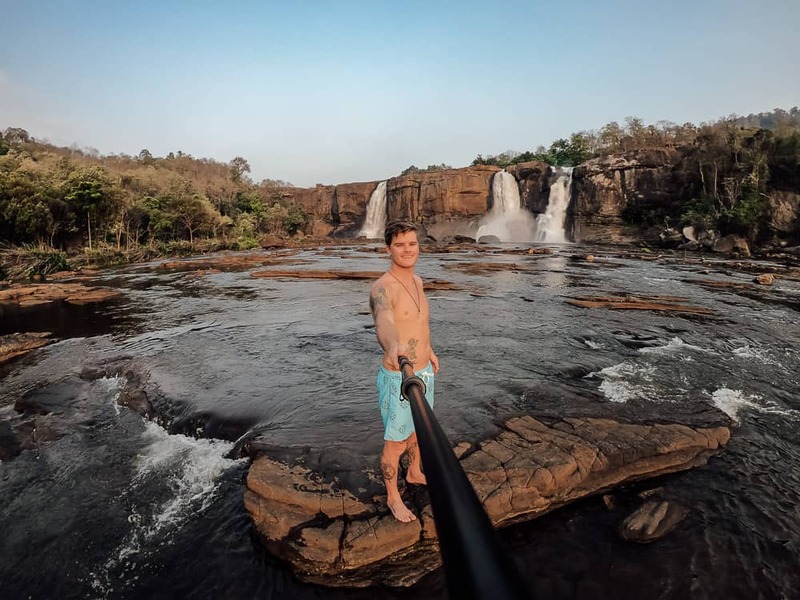 There is a roped off area here where you can admire the insane power of Ahtirappilly Falls and do be aware that it is forbidden to cross over the ropes to get directly beneath the flow of water as this could cause heavy injury or death. As tempting as it may be to get closer to the falls, please obey the rules in place. 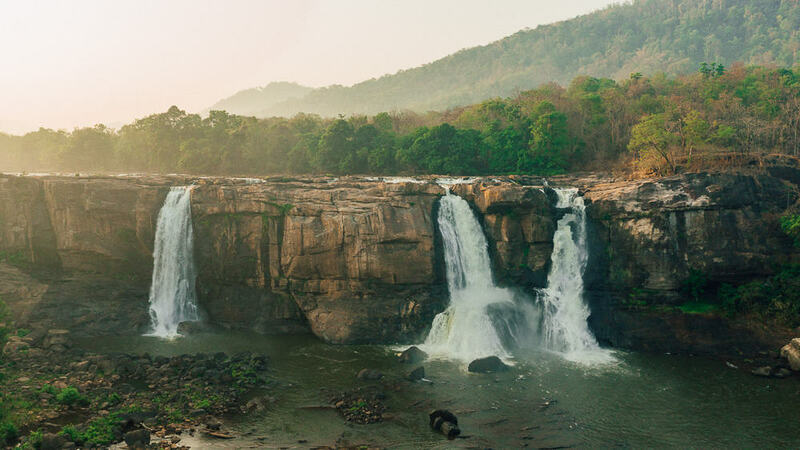 Athirappilly Water Falls is surrounded by dense green rainforest and the curtain of silvery cascading water that thunders down the rockface is absolutely mesmerising. These falls are one of the biggest attractions in Kerala, for both locals and international travellers. Many different Bollywood Films were shot here at this location which is one of the main reasons why Athirappilly India is so popular. The best time to visit Athirappilly Falls is during monsoon season which is from mid-June to October. 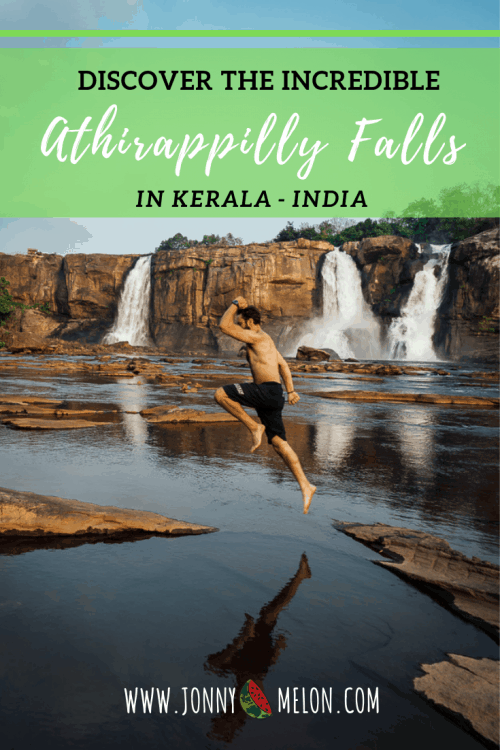 During this time is when Athirappilly Falls shows off its true form as heavy water rages down the Chalakkudy River and covers the entire rock face. 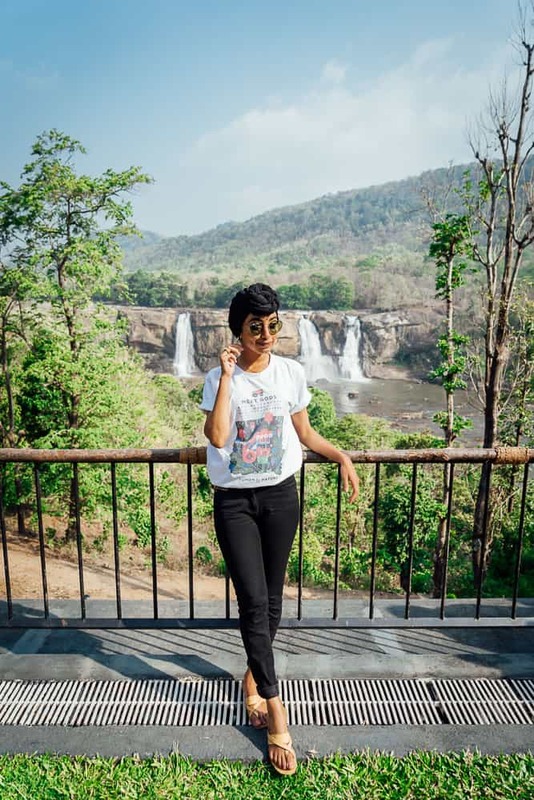 My friends and I visited Athirapilly Water Falls in April and although there wasn’t much water flow, the nature that surrounded us was still as beautiful as can be! 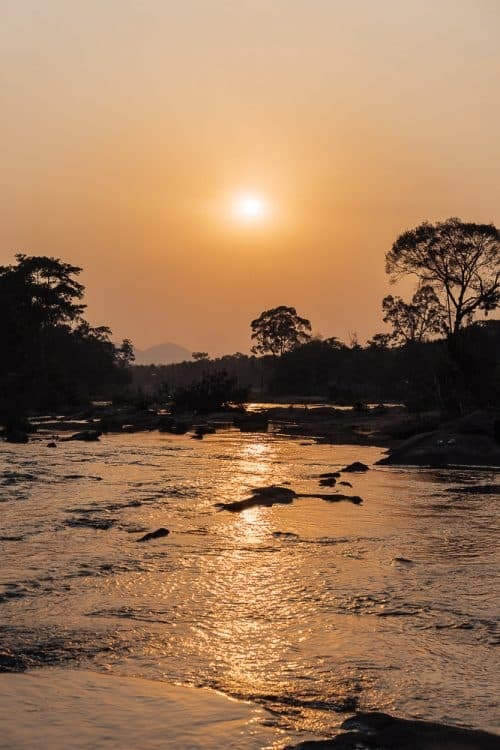 I believe we wouldn’t have been able to walk out into the middle of the river had it been during monsoon season, so we were lucky in that respect to be able to swim in the rockpools and enjoy the time we had there.